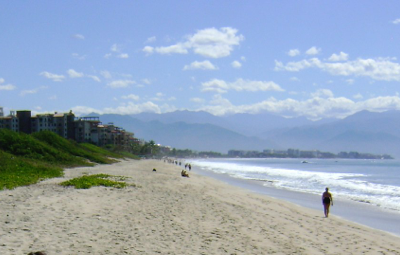 Just two blocks from your Aventura Pacifico accommodations in Bucerias you will find one of the loveliest stretches of beach in all of Pacific Mexico. 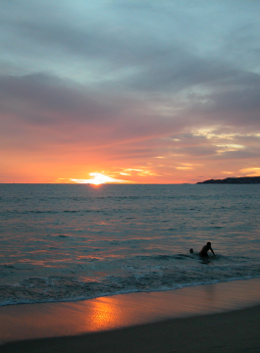 More than eight miles of golden, creamy sand are lapped by the warm and generally calm waters of the Bahia de Banderas (Bay of Flags), one of the world’s largest protected ocean bays. 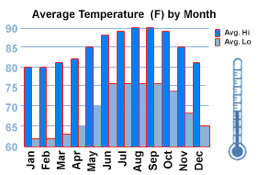 Water temperatures are generally in the blissful range of 75F to 85F / 24C to 30C year-round (see chart below), and the conditions are often perfect for boogie-boarding, body-surfing, sea kayaking, parasailing, kite surfing and other water sports. 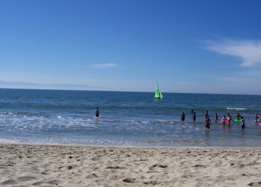 Whale-watching, scuba diving and deep-sea fishing expeditions can also easily be arranged. 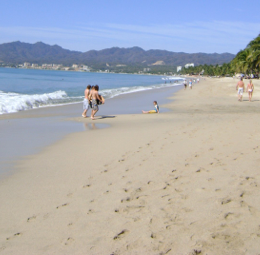 Surfers can enjoy several good breaks on the bay just north of Bucerias, while only 20 minutes up the coast the bigger wave action of the open-ocean surfing hamlet of Sayulita beckons. 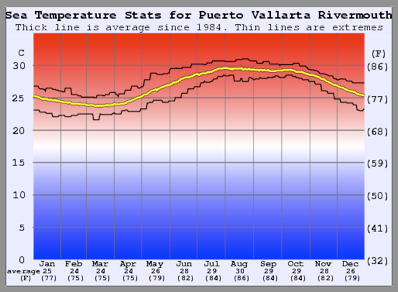 The climate in Bucerias / Puerto Vallarta is sometimes described as the first real year-round ‘t-shirt & shorts’ weather on the Pacific Coast of North America, as one travels south. 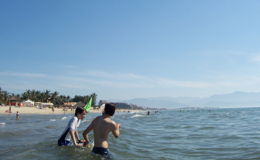 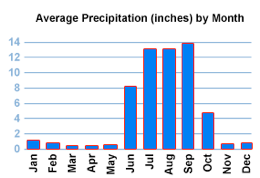 From November through May there is very little rain and the skies are almost always clear and sunny, with perfect highs of around 80F/27C, making for very comfortable beach-going conditions during the day and very pleasant sleeping conditions at night, even without the use of air conditioning. 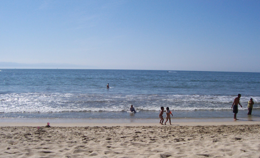 During the summer months (June-October), the area gets higher temperatures and spectacular downpours, but highs peak around 90F/32C, and much of the rainfall occurs in the evenings cooling things down before bedtime, so as tropical weather goes, the area is blessed with a wonderfully livable climate, even during the warmest months of the year.